Of course any TMNT Party has to have pizza, but I needed some sides and some treats to go along with it. 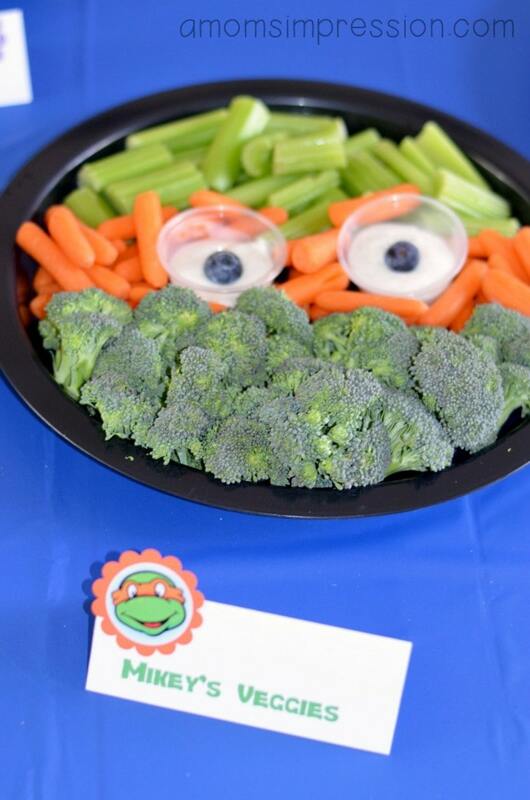 I came up with two fun sides that included veggies and fruit for all the little ones. I think Mikey would have looked too much like Oscar the Grouch if it wasn’t’ for my fruit Rafael. Seeing as though everything was TMNT, I don’t think anyone else thought they looked like muppets. 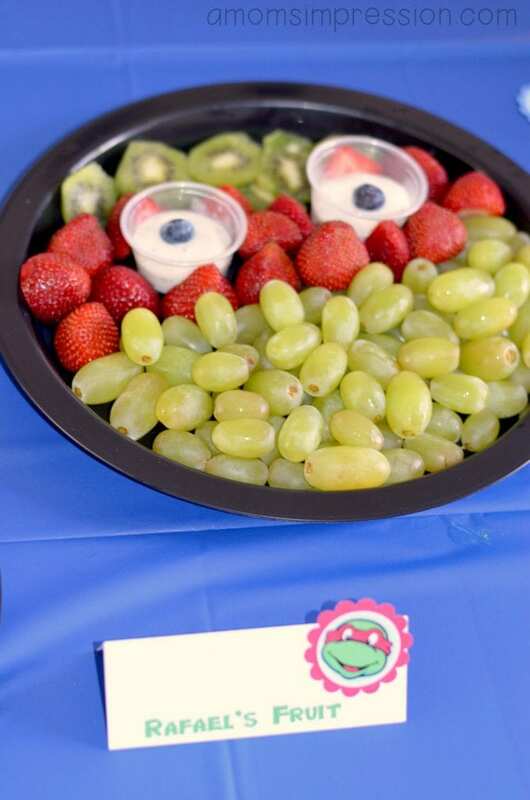 These were simple and you can mix and match any veggie or fruit to create any of the turtles. Think blueberries and blackberries for Leonardo and Donatello! For the adults, I had some Iced Tea/Lemonade combo labeled as Sewer Water. It really looked the part. For some of the treats I had a little too much fun and probably went overboard. 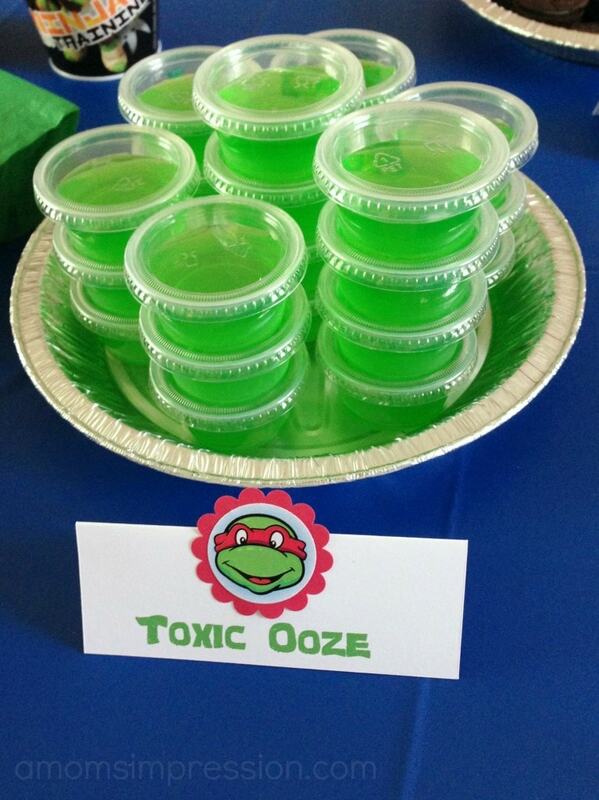 Of course we had to have some toxic ooze! I did green but you could also do purple for Mutagen. I took a little help from the bakery on the cupcakes and the small cake. I got plain green cupcakes and a plain small personal cake for Jonah. I then decorated them with picks and 2 little TMNT figures that I found at Target. My son loved it. One lesson I learned is that I need to hire a photographer. Next year I will. I went around frantic trying to keep the party going, restocking the food and making sure all the games were running smooth that my photos really suffered. These pics aren’t the greatest, but I hope you can get the inspiration behind them. 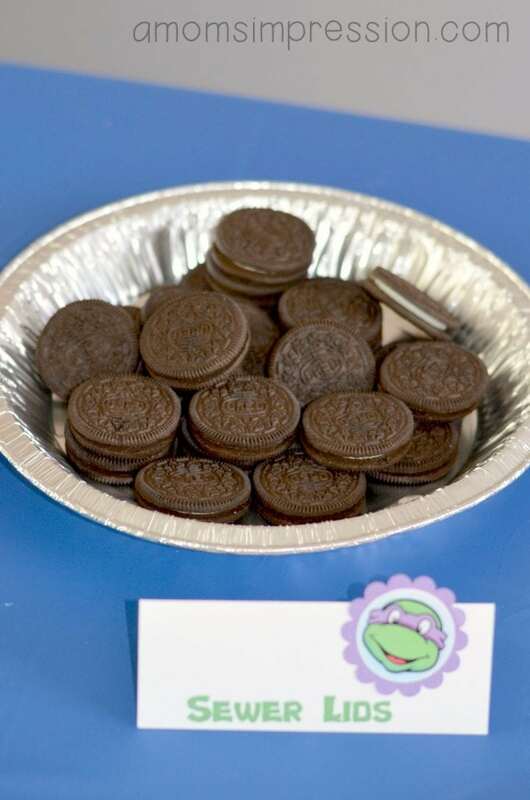 These Oreo cookies were perfect as is for sewer lids. I love the pie tin that I put them in. It gave it a very rustic feel. 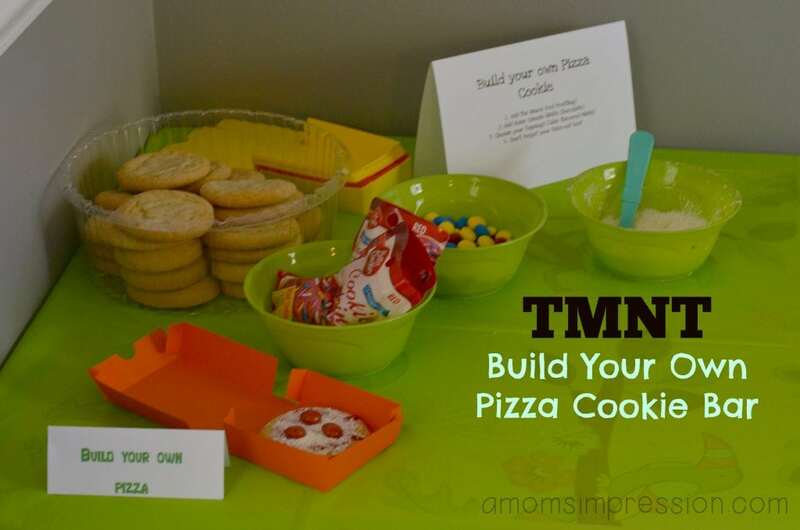 One of my favorite activities was building personal sugar cookie pizzas. I cut out some small pizza boxes using my Silhouette machine for our guests to be able to take them home. 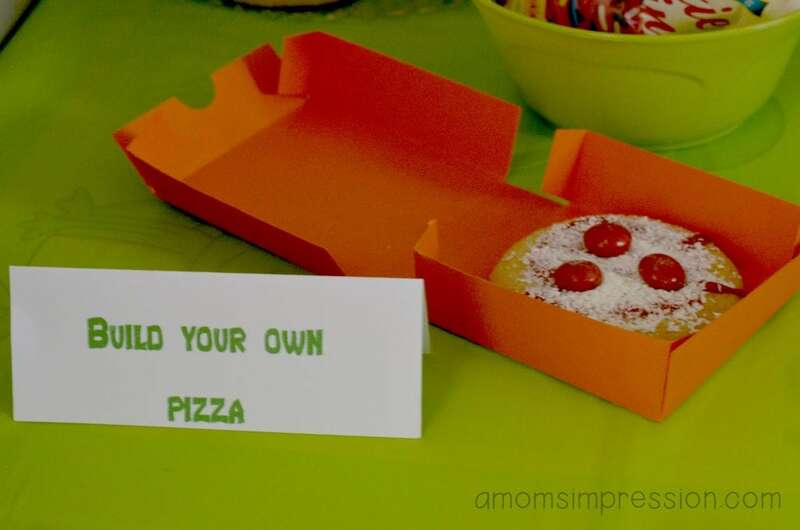 They made them using red icing, grated white chocolate shavings for cheese, and some M&M’s for pizza toppings. The kids loved it! I also had a candy bar with a lot of different snacks, but I didn’t take a picture of it (photographer again). Overall the food was a huge success. We had a great time eating pizza and snacking on all of the treats. After we ate we had fun with games and activities that I will share in Part 3. For now I will leave you with a sneak peak! « Disneynature Bears Now on DVD and Blu-ray! How creative. I love the fruit & veggie trays – those are so cute! OMG – that is all so stinking cute!! I am not creative at all like that. Great job! I love your ideas! 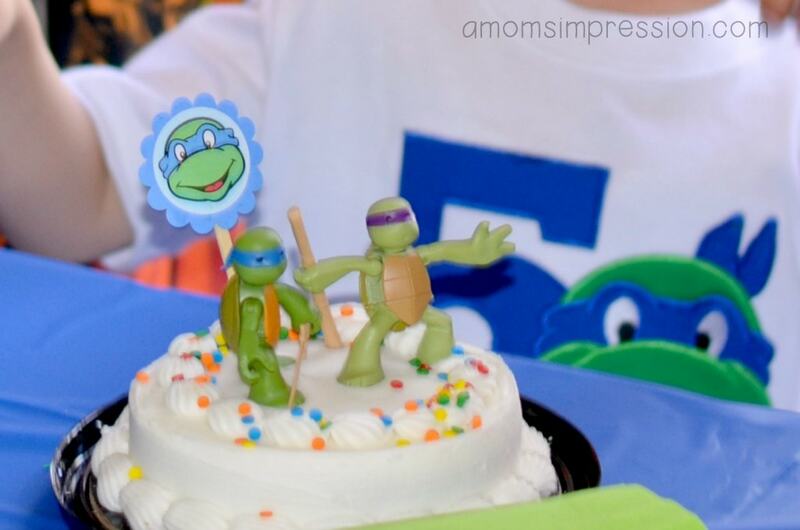 My son is a big TMNT fan and always wants a ninja turtle party! Such an adorable and creative party. I love all that you did especially since it’s ninja turtles. Go ninja go ninja go. I love all the favors and food so cute! What a fantastic party, so cool! I wouldn’t mind having my own TMNT party. The build your own cookie pizzas are fun! How cute! You did such a god job! This looks great! My kids would have so much fun! 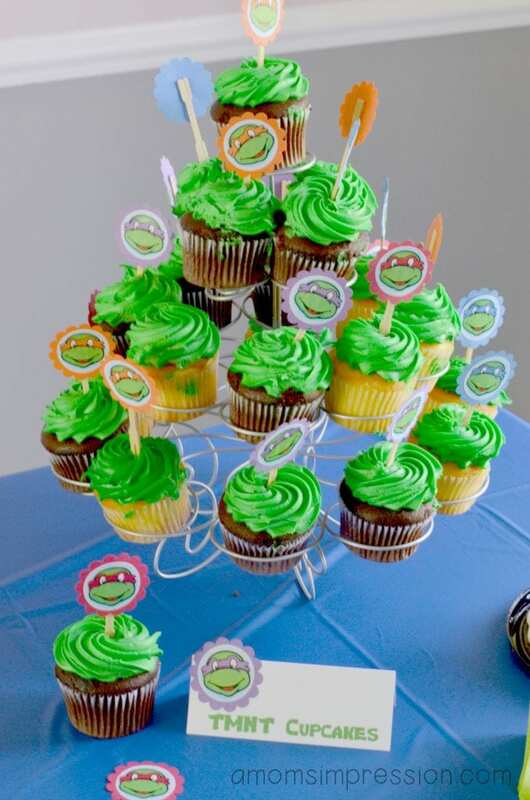 Kat..your pictures are great and the TMNT theme welcomed guests as they arrived and bid them farewell as they left. You did it all in a couple of hours! That day was so much fun. You and Joe were all over the place and made it look like just “another fun day at the Hodson’s!” The weather was perfect for the kiddo’s to be outside and if you remember…the parents were having as much fun as their little ones! 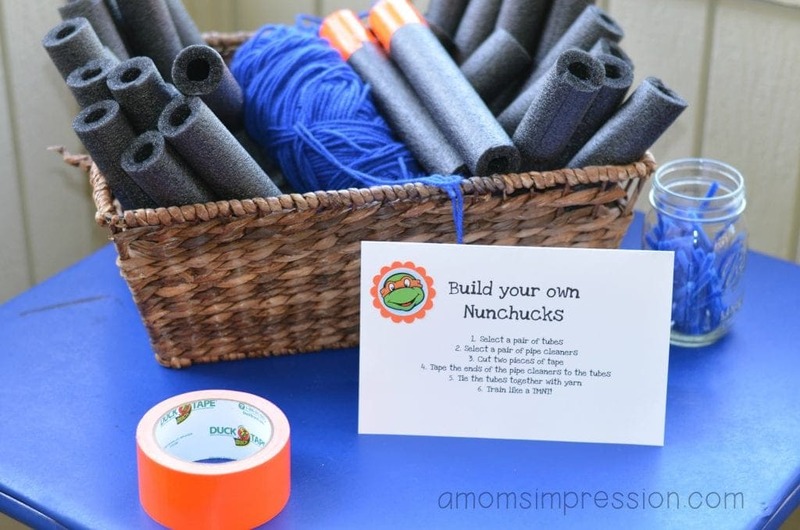 Part 3 will be fun to see…the nunchucks were great and so were a few other fun activities that I won’t mention…stay tuned! 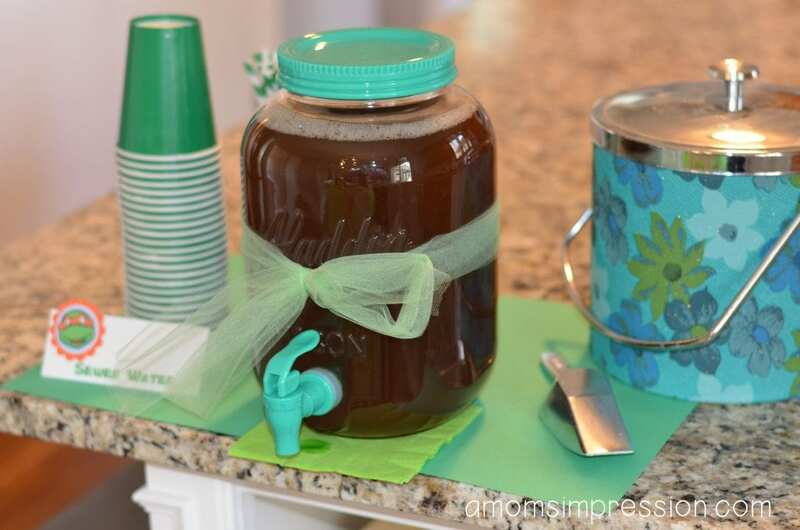 Idea for next party…ask Aunt Amy to be your photographer…she would love it ! Great, great party! I may have to do some of this. 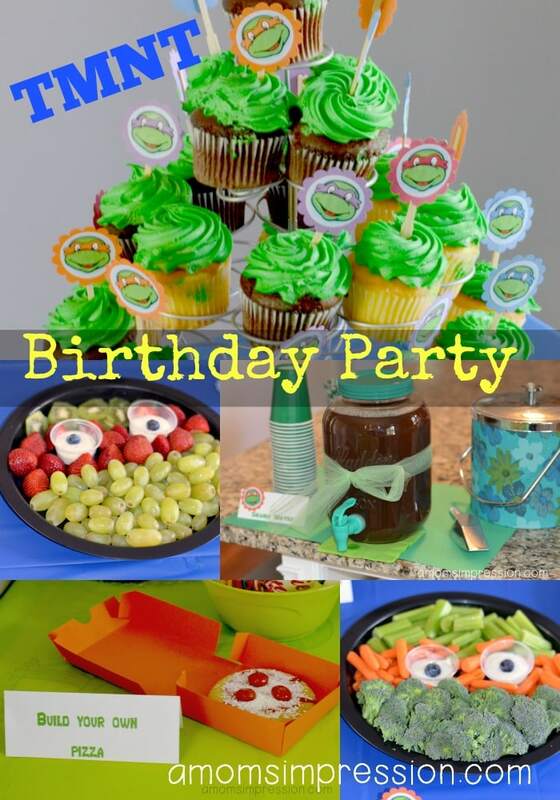 These are great TMNT party ideas. I’ll keep the in mind for the grandkids’ birthdays. Where did you get the jello containers with lids? Thanks! I can’t find how you made the Toxic Ooze?? What did you use?